A statistic is any quantity that is calculated from the data in a sample, such as the mean and the standard deviation, which characterises an important aspect in the sample. Statistics are useful mathematical tools for data analysis. Statistical tools are so useful that statistical analyses are performed by individuals from many disciplines – from those in STEM fields such as people who conduct clinical studies to those in finance and management. All experimental measurements contain some variability. When one makes experimental measurements, one should question the reliability of one’s measurements. Given that no conclusion can be drawn at 100% certainty because doing so would require us to make an infinite number of measurements, statistical analyses gives us tools to determine estimates from a finite number of measurements. From these estimates, we can draw conclusions at certain probabilities. Dealing with a large number of experimental measurements and using statistics by hand to analyse your data can be labourious and time-consuming. For this reason, we strongly recommend using software such as Microsoft Excel to perform all calculations. 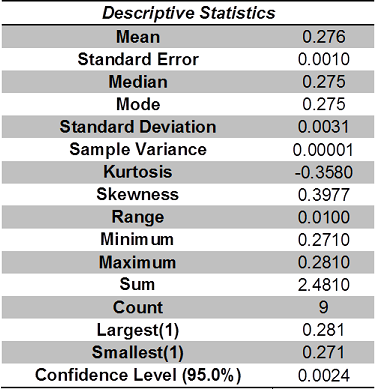 Microsoft Excel has a feature called “Descriptive Statistics”, which we discussed in another article. For more advanced statistical analyses, the likes of GraphPad Prism and Minitab may be used. 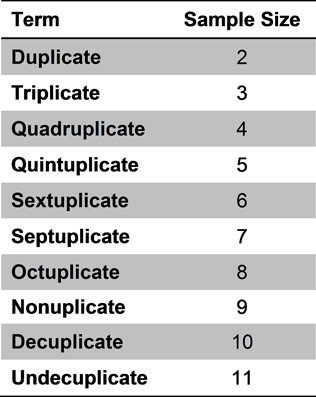 In the analytical sciences, the number of measurements or data points, sometimes referred to as the sample size, is given the symbol n. Replicate measurements are typically performed in triplicate (n = 3). At times, an analytical scientist may perform measurements using sample sizes higher than 3. Perform an analysis of the measurements above using statistics. 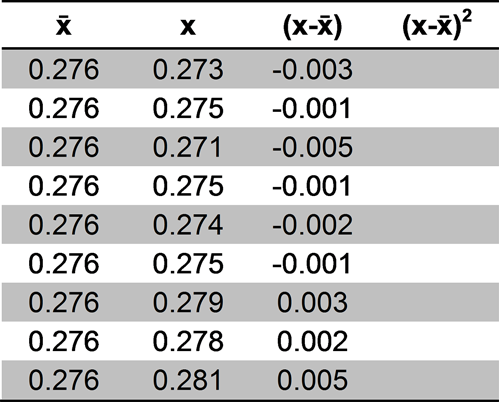 The mean (x̄) can be defined as the average of the data. Means can be calculated by adding all of the data (x) and dividing the sum by the sample size (n) as per the formula below. We determined the mean earlier as x̄ = 0.276. Step 2: Tabulate the data as shown below. 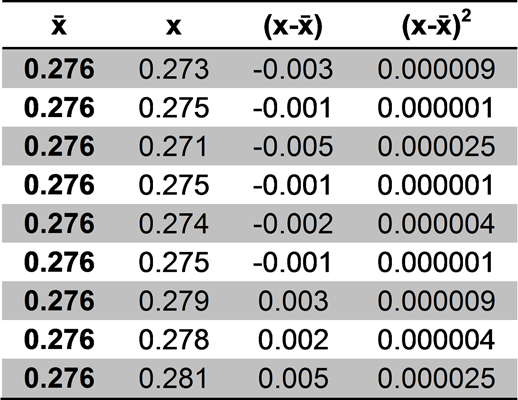 Place the mean value under the x̄ column and the nine absorbance values under the x column. Leave the (x-x̄) and (x-x̄)2 columns blank for now. 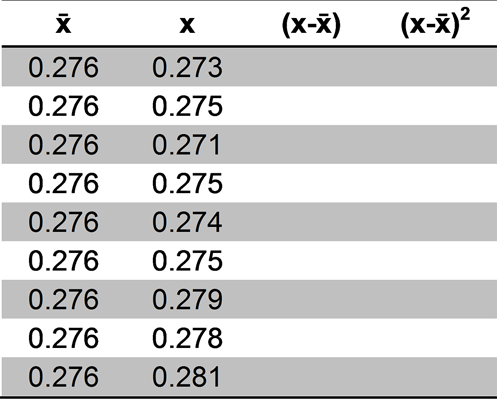 Step 3: Fill the (x-x̄) column for the deviation from the mean by subtracting the mean (x̄) from each absorbance value in each row as shown below. Step 4: Fill the (x-x̄)2 column for the squared deviation by squaring the (x-x̄) values in each row as shown below. Step 5: Add the (x-x̄)2 and then divide by the degrees of freedom to determine the variance. Step 6: Calculate the standard deviation by determining the square root of the variance. The square root of the variance 0.000010 works out as 0.0031. A low standard deviation of 0.0031 is indicative of low scatter for the absorbance values. Again, since this calculation can be labour-intensive, we recommend the use of software. We can further assess the precision of a measurement by calculating a statistic known as the Coefficient of Variation (Cv) which is also referred to as Relative Standard Deviation (RSD). In the analytical sciences, Cv values are often in the 1-5% range. Values of less than 1% are considered excellent. Cv as a percentage is simply the standard deviation divided by the mean and multiplied by 100. A set of measurements with a small standard deviation and small coefficient of variation is deemed to be precise. It is important to note that greater precision does not necessarily mean greater accuracy! For the nine absorbance values above, the Cv works out as 1%. Standard deviations and Cv values provide insight on the dispersion of data. Recall that we cannot draw conclusions with 100% certainty as doing so would require an infinite number of measurements and that we use statistics to calculate estimates of “true values” from a finite number of data points. In order to quote uncertainty, we construct confidence intervals (CI) at certain probability levels, typically at 90%, 95% or 99% (95% is quite common). CIs are a range of values about the sample mean which at a certain probability contains the “true mean” (µ). Note: For this part, you will need statistical tables! Using the expression above, we can construct a 95% confidence interval for the absorbance values. We have already determined the sample size (n) = 9, degrees of freedom (n-1) = 8, mean (x̄) = 0.276 and standard deviation (s) = 0.0031. We can obtain t-values from statistical tables or calculators at certain confidence levels. Based on statistical tables, tn-1 = 2.306 where the degrees of freedom (n-1) = 8. All we need to do now to construct a 95% CI is to fill the expression above with the numbers and perform our calculations. We can state with 95% confidence that the “true mean” absorbance value for the solution of aspirin analysed lies between 0.274 and 0.278. Note that there is an inverse square relationship between CIs and n.
Sometimes, it may also be useful to report the mode and the median. The median is simply the middle number when the numbers in a dataset are arranged in order. The mode is the most commonly occurring value in a dataset. The median and the mode for the nine absorbance values work out as 0.275. 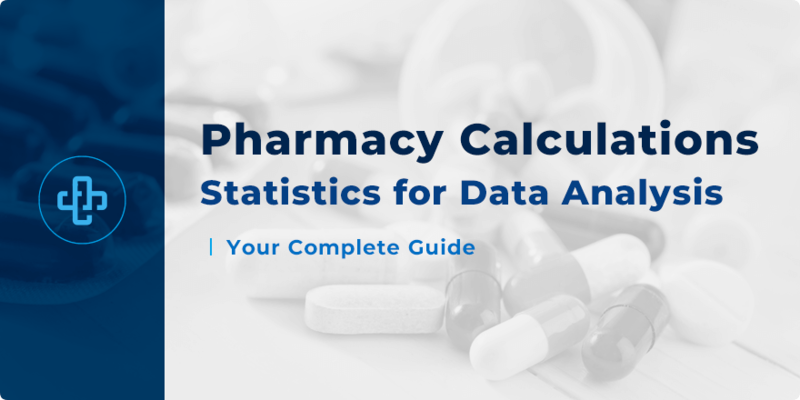 Want to learn more about pharmaceutical calculations, statistics and the like? Be sure to come back to our section on pharmacy calculations as we add even more great content to help you with your study.